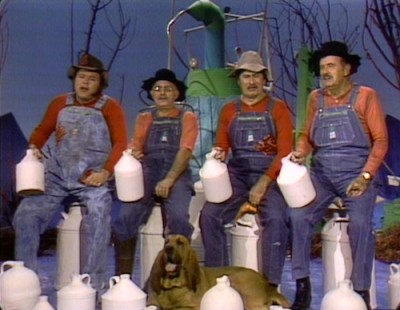 Conceived as a down-home response to Rowan and Martin's Laugh-In, Hee Haw may not have snagged the positive write-ups of its predecessor, but it sure got the last laugh in the longevity department. 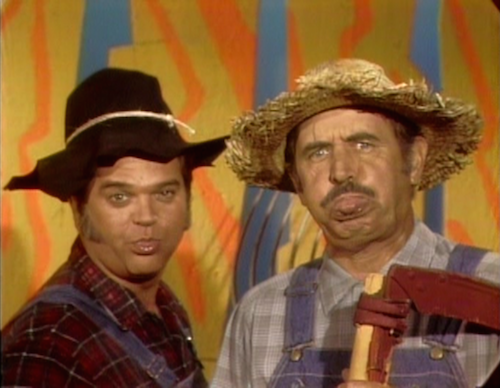 After two successful years on CBS ('69-'71), the show was swept out during the "rural purge" that saw the cancellation of Red Skelton's variety show and sitcoms like Green Acres and The Beverly Hillbillies, but Hee Haw resurfaced the next season in syndication and continued running on into the '90s. Time-Life has offered various episodes of Hee Haw on home video over the years, and they are once again offering a new batch of "Hee Haw Collections." The more basic 1-DVD and 3-DVD sets are available from retailers like Walmart and Amazon (DVD Talk was sent the 3-disc version for review), but you have to go directly to the Time-Life website for the 8-DVD and 14-DVD editions. These are not complete season sets, instead highlighting cherry-picked episodes from the first decade of the show (the 1-DVD and 3-DVD sets stick to the show's first three years). Of course, you'll have to judge your own interest in the show to determine which set is right for you, but even if you just want to sample one of the basic sets, the 3-disc version is a better bet, as the second and third discs feature material that often outshines the first. 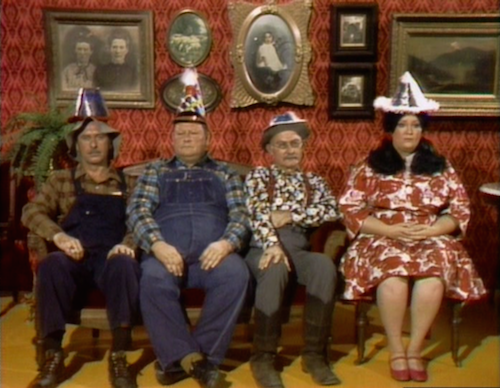 Hee Haw is a show with one foot in the past and one in the future. Hosted by country music superstar Buck Owens ("I'm a-pickin'...") and talented musician and comedian Roy Clark ("...and I'm a-grinnin'! "), the show was less a typical variety show than it was a rapid-fire corny joke delivery system that also took breathers for some great country music performances. By all accounts, the jokes (which typically take on the question-and-answer form you find in children's joke books) are intentionally old-fashioned and groan-worthy, but the show flings the jokes at the wall so fast and furiously that some of them stick. In fact, I'd say two of the five episodes in this set are consistently funny enough that I wasn't quietly praying for the next musical number to arrive whenever one of the comedians opened his mouth to speak. In those funnier episodes, it's easier to appreciate the unusual patchwork way in which the show was created. 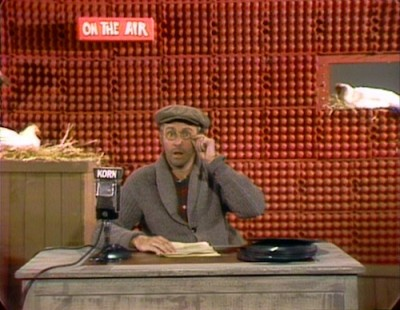 There are few actual comedy sketches in the show, but there are many different recurring small-town settings -- the cornfield, the barber shop, the general store, the front porch -- where characters congregate and trade their one-liners and whatnot, and it's all edited together like a proto-Vine compilation video. There are no real host segments, just some interstitial barnyard animation to make the editing less whiplash-y. It all becomes about rhythm and momentum, which is a notably forward-thinking idea for such a fundamentally backward-looking show. The ensemble cast is uniquely suited for the show's short-attention-span shenanigans. Buck Owens rarely gets involved in the comedy (apart from occasional asides with his son, Buddy Alan, and the recurring "Pickin' and Grinnin'" segment with his co-host), but Roy Clark seems to relish the chance to get goofy. Other musician-comedians in the cast include old-time showbiz fellers Archie Campbell, Grandpa Jones, David "Stringbean" Akeman, and twin brothers Jim and John Hager (who were touring as Buck Owens's opening act when the show premiered). Minnie Pearl, with her signature flowered hat that still has the price tag dangling, is a legendary standout of the show, although her appearances are few and far between in the included episodes in this set. Junior Samples is another memorable cast member, with a big belly filling out his overalls, a tendency toward particularly awkward line readings, and an unforced authenticity that makes him surely unlike any TV star before or since. Lulu Roman is kind of the Mama Cass of the ensemble, a comic utility player as endearing as the buxom blonde "Hee Haw Honeys," like Petticoat Junction's Jeannine Riley and Gunilla Hutton. Some comics from north of the border are in the mix too (Hee Haw's creators are Canadian, after all), including Gordie Tapp and Don Harron, the latter of whom is frequently featured as an amusingly wordplay-prone radio announcer for station KORN. Of course, a lot of the show's potential viewers are going to be more interested in the music. 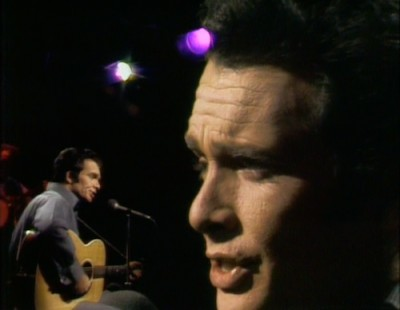 Each of the included episodes features two songs from Buck, who alternates between seeming laidback and vaguely ill-at-ease with performing for the camera; two songs from Roy, who is utterly comfortable on TV and offers an impressive range of both upbeat and moody performances; one song from The Hagers, who have an easy, humorous rapport; and then four or five numbers from the cast or guest stars. The musical guests featured in these five episodes are Tammy Wynette, Merle Haggard, Loretta Lynn, Conway Twitty, Donna Fargo, Tommy Cash (Johnny's brother, who dresses exactly like him), Tennessee Ernie Ford, Charlie Rich, Dottie West, Hank Williams, Jr., and Susan Raye. 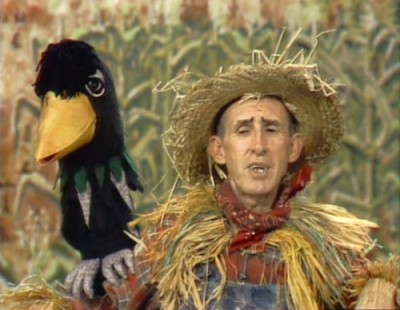 The Hee Haw Collection offers more in nostalgia value than in straight-up entertainment, but it's a pretty worthwhile mix of the two. The Hee Haw Collection is presented on 3 DVDs, packaged in a standard-sized keepcase. Anyone familiar with late '60s color TV knows that it's a far cry from what gets broadcast these days, but the standard 1.33:1 video presented here is surprisingly clean, with little in the way of analog distortion and videotape damage. There's not much fine detail, but it's not a distressingly fuzzy mess either. The Dolby 2.0 mono audio holds up even better, with only a few fairly prominent isolated pops distracting from what is otherwise a crisp, nicely mixed and distortion-free soundtrack. Hee Haw Laffs, Vol. 1 (29:30) - Considering how hit-and-miss the show's humor is, I was a little wary of this, but whoever edited this comedy highlights reel deserves a pay raise, because this is laugh-out-loud funny, with bits like Archie Campbell's spoonerism-laden retelling of "Cinderella" (i.e., "Rindercella"), Junior Samples' continued failure to deliver the punchline "Trigonometry," and the cream of the cornfield-jokes crop. Roy Clark Interview (23:15) - A disarming and nicely illuminating interview in which Clark discusses the way that he, like most of the cast, stumbled into this project not really knowing what it was, and how that feeling continued until he was shown a rough cut of the first episode. He offers some funny recollections of Grandpa Jones, Minnie Pearl, and Junior Samples, including a incident where Junior offered Roy a pork and beans cocktail. Lulu Roman Interview (11:30) - An appropriately offbeat chat with the big-boned "funny girl" of the cast. She talks about being an orphan-turned-hippie with no knowledge country music who had to figure out the hard way that she was being plunked down into the middle of a bunch of legends. George Lindsey Interview (5:17) - Lindsey is the first of two performers interviewed (Roni Stoneman is the other) who actually came to Hee Haw after the period focused upon in this 3-disc set. Nonetheless, he has a few good stories about joining the show and his fellow cast members. Roni Stoneman Interview (10:20) - Stoneman offers recollections of working on the show in Nashville and her impressions of the other people on the show, like Junior Samples and Minnie Pearl. George Yanok Interview (10:03) - One of the writers, Yanok offers anecdotes about how the show found its way after a tumultuous beginning. He talks about the way the writers would rank the quality of the jokes and then go into the edit, intentionally mixing in the groaners with some good ones, counterpointed by the music. Charlie McCoy Interview (7:25) - A long-time Nashville studio musician, McCoy talks about how he worked his way up to becoming the show's musical director for nearly two decades. Jim and John Hager Interview (11:34) - The musical twins discuss how they became regulars on the show after performing as an opening act for Buck Owens, including how they signed their contracts before they even knew what the show really was. Lots of fun anecdotes, including stories about surprising meetings with Leonard Bernstein and Leslie Nielsen. 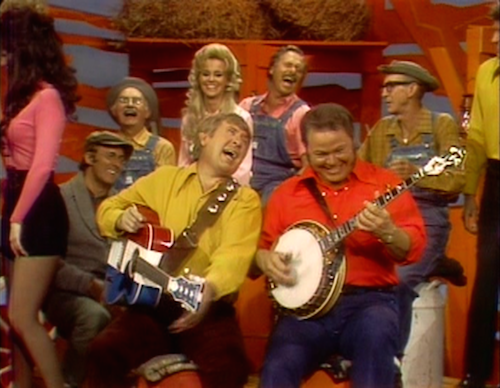 The magic formula of intentionally dumb jokes and great country music made Hee Haw a long-running TV institution. This set of five hour-long episodes might not satisfy the die-hard fanatic (you'll have to upgrade to the 8- and 14-disc sets for that), but it offers a nice primer for the casually curious. Recommended.